I’m so excited to bring this Mango Lime Lassi / Mango Lime Yogurt Smoothie to you. This is new addition to our favorite drinks list. I have already told about this FB Recipe Swap Group in this post. This time I got swapped with the talented fellow blogger and good friend Jagruti . She blogs at Jcookingodyssey. She is an awesome blogger and beautiful photographer. Her photography is to die for. Head over to her blog and do check for yourself. So when I was assigned to recreate her recipe I felt like I’m lost in the sea of recipes. Even before I joined this FB group, I eyed on many of her recipes to try. So this is a good opportunity for me to try one of her recipes without delay. I decided to make Mango Lime Lassi as that is the one I was eyeing since I saw that recipe in her blog. My biggest concern was how I supposed to match her photography? I believe I did some justice, do let me know your thoughts about it. As I said that this recipe is adapted, I didn’t change anything except the quantity. You need nice pulpy mango like Alphonso for this. The mango with lots of fiber will not work for this I believe. Then creamy yogurt, full fat milk, required sugar and lime juice. Blending all this will result in thick, creamy, delicious Mango Lime Lassi. I was blown away when I took the first sip. I realized then that I made too much little quantity for all four of us. Oh no, I’m going to make again. In the original recipe, she used frozen mango but I used fresh. Try to use fresh, thick, creamy yogurt. It gives nice texture. I was concerned how the lime with milk and mango tastes. But I bet this is the best. 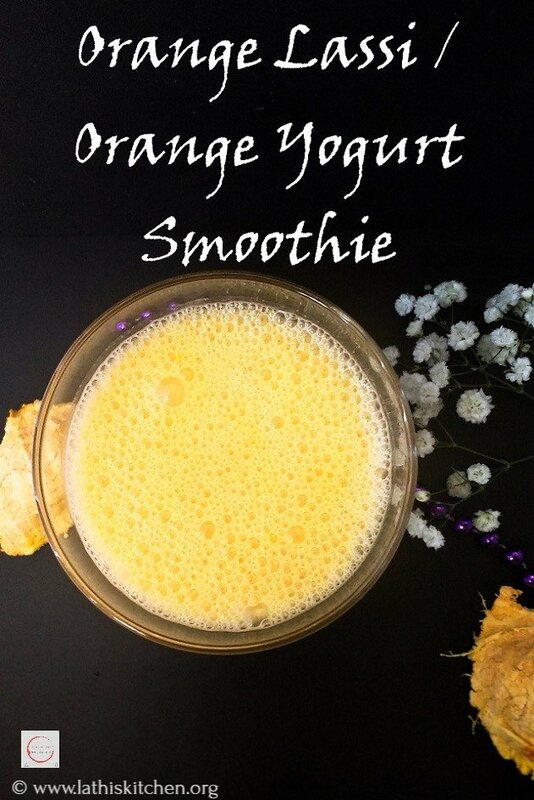 You can also try my Mango Lassi and Orange Lassi if you love lassi. If you try this recipe and loved it please do click a picture and tag me #lathiskitchen in Instagram, so I can see and share your creation. You can also follow me on Facebook, Twitter, and Pinterest. You will get updates without fail. You can also subscribe us for free and get yummy recipes right into your inbox. Take all ingredients except lime juice in a blender. Blend till smooth thick creamy. Add lime juice and just pulse it. Use pulpy mangoes like Alphonso. Adjust sugar as per your requirements. Add water only if you want thin consistency. I'm so excited to bring this Mango Lime Lassi / Mango Lime Yogurt Smoothie to you. This is new addition to our favorite drinks list. Add water only if you like thin consistency. Sending this recipe to Fiesta Friday this week co hosted by Laurena and Jenny. Super cool. Love the mango, lime combo what a lovely colour. Looks refreshing and delicious. I prefer this kind of fresh smoothies for breakfast! Mango is a fruit to die for! Lassi looks thick and luscious ! Perfect way to enjoy the king of fruits this season! Mango line lassi looking so delicious. creamy thick texture looks so tempting. Mango lassi is my favourite summer drink. Love your version with hint of lime. Super delicious lassi, never tried adding lime in lassi, will give a try to this combination very soon.. Very refreshing drink there. Never tried lime in a mango lassi..I think it would be a flavorful variation ! Thank you..Glad I could be part of the linky party.. I have not tried this combination with lime, will definitely do. Thanks for the wonderful share! Super quick and yummy recipe dear.